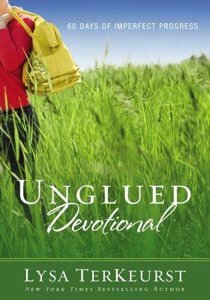 Customer Reviews For "Unglued Devotional"
I really enjoyed this companion devotional to Lysa's book 'Unglued'. Each day contains the same four elements: a Bible verse, a thought for the day, devotional segment and a prayer. This little book has 60 days worth of inspiration and encouragement. I have read this devotion twice and it still empowers me daily to make "imperfect progress" in controlling my emotions.